Say good-bye to one-size-fits-all incentives. Today's motivational programs are much more sophisticated, and the best ones are tailored to employees' needs. Here's how to make sure yours hits the mark. A Fortune 100 firm spent $20 million a year on recognition and incentive programs only to find out that the plan was a major flop. Hear that giant sucking sound? It's millions of dollars going down the drain. To be sure, right now, somewhere in corporate America, some large company is pouring away money on an incentive program that will be completely ineffective. Bob Nelson is sure of it. Nelson, president of Nelson Motivation Inc., is a recognition consultant who has worked with dozens of companies that simply don't have a clue about how to put together an incentive program. In fact, one Fortune 100 firm he has worked with spent $20 million a year on recognition and incentive programs only to find that the plan was a major flop. Why? It turns out employees wanted a plan based on performance, but the company's plan was based almost exclusively on years of service - a somewhat outdated motivational model. "What motivates people today is different from what motivated them 10, 20, 30 years ago," he says. "Traditional models may have worked in stable, predictable times, but we're not in those times anymore." An example of an older model would be years of service awards, which Nelson says became more of an "endurance award" after the downsizing and mergers of the '80s and '90s. Today's workplace is multigenerational, including boomers who lived through the downsizing years, Generation X, whose workers seek meaningful employment and an active role in problem solving and the rising Generation Ys, who crave informality, immediate feedback and varied experiences. Incentive programs must cater to this range of desires while maintaining a focus on company goals, Nelson stresses. A smart way to make sure a new incentive program will fly is to solicit employee feedback before launching it, says Nelson. Problem is, few companies do that. "Companies don't do the simplest thing, which is ask people what they want," he says. "I would go so far as to say that the things done by most companies do not align with what most employees would like to see done if the goal is to motivate them to perform. "The task for management is to work with employees to find out what incentives should look like in the work environment at hand," he says. "For example, regarding information: what information, how frequently, from whom, in what form? Which will lead to further questions, such as, 'How does the company communicate the purpose and mission of the organization?'" Others see similar corporate plans. "Most plans just say 'give them stuff,' but motivation is far more complicated," says Bruce Bolger, managing director of the Forum for People Performance Management and Measurement at Northwestern University. "It must include having a goal that employees believe is plausible, training to ensure that employees are capable of achieving it and an appreciation of the steps necessary to get to that goal." What employees respond to can be understood on two levels. There is the need to keep employees feeling connected, relevant and well-treated, which is really a reflection of corporate culture. As Nelson puts it, "Give me the information I need, ask me my opinion, allow me to pursue an idea I have, support me when I make a mistake." Building on this, an incentive program seeks to promote specific goals. "An incentive program is really an internal promotion, a means of driving a specific behavior during a specific time. Incentive programs address specific behaviors and emotions," Bolger says. Programs must include a goal that employees find plausible and that is attainable by more than a small percentage of the team. In most companies, "the top 20% will do well no matter what, the middle 60% go either way, and the bottom 20% should be fired," Bolger says. Incentive programs should be structured so that people in the middle group are competing against themselves, rather than the top performers. Closed-ended, or "tournament," programs are de-motivational to the middle 60% of the team, because only the top performers are being rewarded, Nelson says. He recommends a combination of open-ended (where everyone earns points for effort) and closed-ended (competitive) programs. Such an idea is put into practice by commercial printing company PrintingForLess.com. Key to the company's program is the setting of tiered goals: a minimum "must hit" goal, a "stretch goal" that meets the company's operating plan and a "super stretch" goal, according to PrintingForLess Director of Human Resources Marne Reed. "If you set goals too high, people don't even try," Reed says. "This program gets everyone engaged and motivates people to hit the high goals, which take a lot of work and a lot of effort, and everyone rowing in the same direction." Performance bonuses are company-based, rather than individual, to encourage teamwork. However, the program allows for internal competition driven by the sales force (not management). "Departments create their own smaller incentive programs," Reed says. "For instance, when one team hits a certain goal, they get a garden gnome. It's a way to make it fun." In addition to company bonuses, managers can hand out smaller-scale "attaboy" perks, including gift certificates and other rewards, for individual effort. These gifts are designed to be personable and empower managers to drive behavior in ways specific to their own personality and team. Tailoring rewards can function in surprising ways. Nelson points out that Generation Y - your youngest employees - crave special experiences such as box seats at sporting events, but so do older, top salespeople, who already have most of the material goods that might be offered as part of an incentive program. The important thing, Nelson stresses, is that companies tailor rewards to the individual. Nelson also recommends that companies avoid falling back on cash. "The purpose of recognition is to get attention, to create buzz," he says. "Cash goes into the checkbook, and people forget what it's tied to. There's little buzz, because people don't like to brag about cash rewards." Therefore, "mix it up," he advises. Gift cards, theater tickets, merchandise: "the general rule is the more sincere they look, the greater value they have," Nelson says. "Money is not always the incentive," agrees Anne Houlihan, a business consultant, HR trainer and president of manufacturer Satori Seal. "They might want a day off, or a gift certificate, tickets to an event, gift cards or lunch outside the office. I do birthday programs - a cake, gift, party. It can get hectic sometimes when there's four birthdays in one month!" Hinda Incentives, a company specializing in incentives and performance improvement, offers a point-based incentive program built around a variety of merchandise awards. "Research shows that when a tangible image is formed as far as what the award is, people work harder for it," company relationship manager Linda Wodele says. "They visualize the goal and take regular steps toward achieving it." In four categories - electronics, personal, home and recreation - participants can choose from a variety of items, from blankets, shirts, coffee mugs, towels and golf balls up to iPods, TVs, bicycles and golf clubs. At the high-end range, for exceptional achievers, there are fishing boats, Segways, Yamaha grand pianos and massage loungers. Hinda consults with executives regarding what they're trying to accomplish - it could be cost savings, revenue generation, better customer service, or any number of other goals - and formulates strategic objectives by working with employees and managers to learn what can drive that goal. Programs are geared to the individual level, Wodele says, "so that you don't have a janitor saying 'I can't impact the business,' when in fact perhaps they can, because keeping things clean and in good repair is an important part of the business' operation and image. "The programs drive success by reinforcing the behavior in individual employees." People can track their progress with a "performance bank account," and reward each other for exemplary effort with peer-to-peer e-cards. Managers are empowered to give out "spot rewards" to individuals demonstrating company values, while executives can track which managers and departments are using the system effectively. An important component of successful programs, experts agree, is measurability. For both manager and employees, "measurement is essential," says Wodele. "It's human nature that we learn by trying things and working toward a goal. Unless we can see a path, it's hard to stay focused and motivated." Data collection is crucial. "Having an ongoing tracking system is important for ongoing feedback purposes, which can then be tied to desired performance in the organization, such as sales, service rankings or safety," Nelson says. He quotes a former professor, Peter Drucker: "If you can't measure it, you can't manage it." A primary goal at Satri Seal is customer service, and customer satisfaction surveys allow the company to gauge what is working. Measurability also helps to drive employee enthusiasm. "When employees don't see tangible results, they lose interest," Houlihan says. At PrintingForLess.com, employee feedback surveys are done every six months in order to evaluate the incentive program's effectiveness. The surveys allow for continuing improvements and better communication of certain aspects that might not be clear to employees, Reed says. Employee involvement also drives another key - and often overlooked - quality necessary to a good incentive program: trust. "When an employee believes a manager has his best interests at heart, it motivates him to give his best to his work and the company," say authors Adrian Gostick and Chester Elton in The Carrot Principle. "In an organization where leaders are trusted, there is a greater level of employee investment." Refining the system allows for a concentration of those practices that drive the best results, and an assessment of when it might be time to shift to another goal. Point-based systems are an example of adaptable platforms, whereby goals can be shifted within the framework of an existing incentive program. By distributing points differently, a system that successfully promoted attendance last year can home in on customer service practices this year, Wodele says. When adaptable, responsive and tailored to the needs and desires of workers, a good incentive program makes a lasting difference. 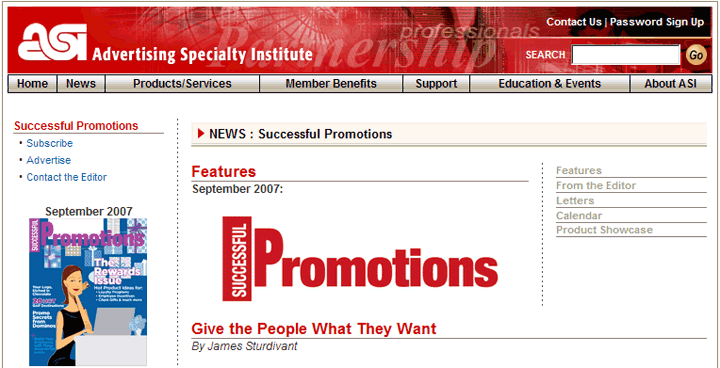 "A properly structured incentive program is a great promotional device," Nelson says. "There's a lot of evidence that the behaviors promoted in employees will continue long after the program is finished." Meeting and maintaining standards of excellence makes everyone feel good - and may in itself be the best incentive of all. James Sturdivant is a freelance writer based in PA.